Paragon Disk Wiper is a handy tool which will securely delete your drive's free space, a complete partition or an entire hard drive, overwriting it multiple times to ensure that nothing can be recovered. And this could be useful in several different situations. If you've just been working with some confidential files, for instance, then deleting them won't entirely remove the sensitive data from your hard drive, and they may still be recoverable with the right software. Tell Paragon Disk Wiper to erase your drive's free space, though, and you can be sure the files have gone forever. And if you're selling a hard drive or PC then you can similarly delete files, remove a partition, even format the entire drive, but all your personal data - user names, passwords, financial details, addresses, phone numbers and more - will probably still be accessible to anyone who goes looking. But again, use Paragon Disk Wiper to clean your drive and every byte will be removed, ensuring that your privacy is fully protected. This is all surprisingly easy to use, too, thanks to some well-designed wizards which walk you through the entire process. If you've no interest in the technicalities then these will have the program wiping your drive within just a few moments. But if you're a privacy expert then you can also design your own overwriting algorithm, telling Disk Wiper which bit patterns to use, and how often. 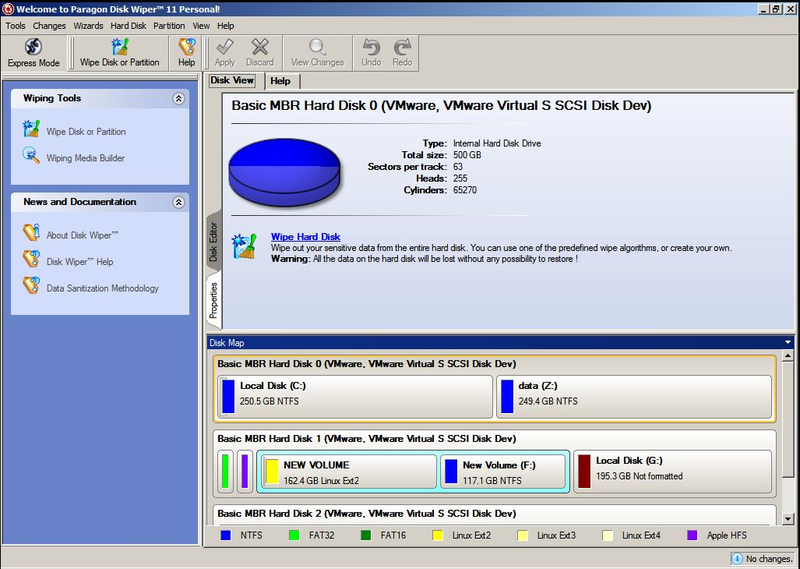 And everyone can benefit from Disk Wiper's bonus hard drive tools, including options to create, format and delete partitions, and check your disk for errors. New features in this version of the program include improved support for the latest drive standards, with the program now able to wipe AFD, 2TB, non 512B-sector and USB 3.0 flash memory drives, as well as IDE, SCSI, SATA, GPT, USB 1.0 and 2.0 disks. There's also better handling of bad blocks, a more detailed wipe report, and the program's core engine and user interface have seen a range of smaller improvements. And upgrading to Disk Wiper 11 Professional gets you built-in support for all the major disk wiping standards (US DoD 5220.22-M, US Navy standards NAVSO P-5239-26, British HMG Infosec Standard No.5, German VSItR Standard, Peter Gutmann's algorithm, Bruce Schneier's algorithm, etc), email notification of the program's progress; and a script generator to assist with automating common tasks. Easy to use and with plenty of features, Paragon Disk Wiper 11 Personal makes it simple to securely wipe internal or external drives.